A tumor is any abnormal lump or bump in the hand or wrist. When people hear the word ‘tumor,’ they often think of something malignant or cancerous, but this isn’t necessarily the case. The truth is, the majority of hand and wrist tumors are benign. Because of the multitude of tissues in the hand – skin, fat, nerves, tendons, bone – a wide variety of different tumors are possible, though there are just a few different types that commonly occur. Ganglion cysts – By far the most common tumor found in the hand and wrist, the ganglion cyst frequently occurs at the base of the fingers and will feel firm to the touch. Generally, the cyst is harmless and filled with fluid. Treatment options include observation, aspiration, and surgical removal. Giant cell tumor – Another commonly found tumor, the giant cell tumor is solid, unlike the ganglion cyst. Giant cell tumors are both benign and slow-growing. Epidermal inclusion cyst – Epidermal inclusion cysts often form just under the skin where a cut or puncture occurred and is filled with a soft and waxy material called keratin. These tumors are always benign as well. These are just a few of the most common types of tumors that we see. Many other types exist that are less common, almost all of which are benign. A physical exam and review of medical records by our team of expert physicians is often the first step to determining the type of hand or wrist tumor present. 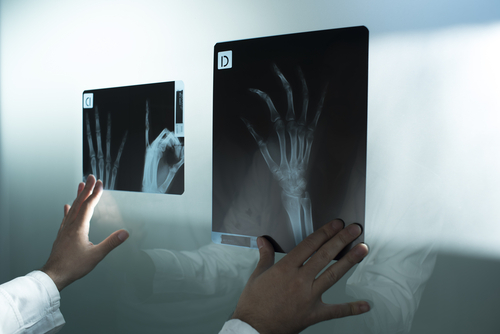 Depending on the location, X-rays may be taken to evaluate soft tissue and bone further. Ultrasounds, MRI, or bone scans are used to narrow the diagnosis further. Depending on the results of other diagnostic testing, a surgeon may request a needle or incisional biopsy before recommending treatment. The most common treatment for tumors of the hand and wrist is surgical removal. Once the tumor is removed, it can be analyzed by a pathologist to give more insight as to the type and cause of the issue. Procedures are often carried out on an outpatient basis. Once a tumor has been determined to be non-cancerous, some patients may decide to take no action and simply observe the tumor for any changes before taking action. Although most hand and wrist tumors are harmless, it’s still important to take the proper steps to remove or monitor them. Our team of specialists led by John B. Stark, MD is highly experienced in treating a wide range of hand and wrist ailments. Request an appointment online, or call us today at 904-825-0540 with any questions.